Coming up Monday, Caltrans will unveil a novel approach to preserving freeway murals defaced by graffiti vandals. 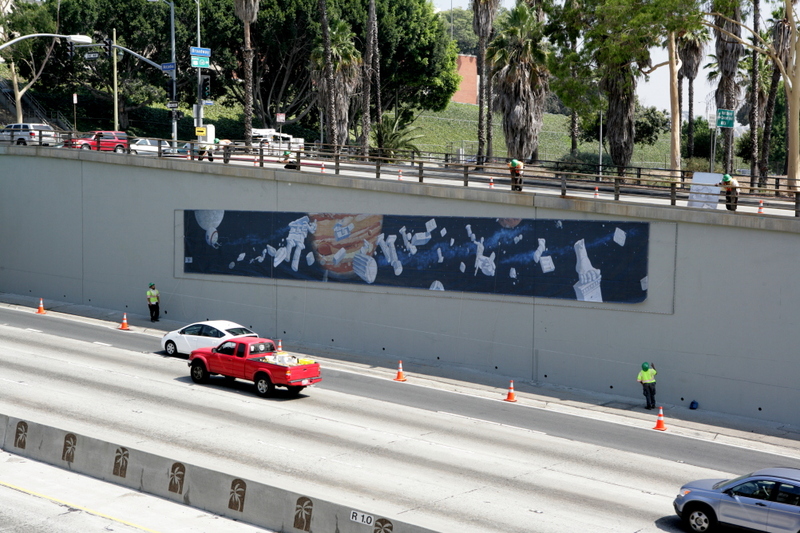 You may remember the murals that once frosted the walls along the 101 in downtown L.A. Several — including “Galileo, Jupiter, Apollo” by John Wehrle and “Going to the Olympics” by Frank Romero — were painted in honor of the 1984 Olympics. They remained undisturbed for years but little by little, graffiti pretty much ruined them. With maintenance funding depleted there was little that could be done. But today and tomorrow Caltrans — supported financially by Wells Fargo with a little help from Metro — will begin installing mesh fabric replicas of four murals on the 101 walls between Spring Street and Broadway. The mural replicas can be removed for cleaning, should something ugly happen in the dead of night. (What are the chances?) An extra copy of each of the murals will be made so that a new mural can be put up quickly and traffic is not disrupted. The fabric is made of recycled material. Wells Fargo funds will pay for maintenance of the murals by the Los Angeles Conservation Corps. So hooray for art! Hooray for Caltrans, Wells Fargo and Metro! And Hooray for recycled mesh material! May it help keep art, these murals and possibly other murals alive. Some good news on a day when it was very much needed. Thanks. Those murals are an eyesore. Wow those seemed lost and forgotten, they were a great part of the BIG 80’s LA landscape. I only thought watching the movie “Ruthless People” would remind me of them as they pass by those on a freeway chase! What about the buckle up mural? As a child I vividly remember looking up from the backseat to see that police officer’s stern warning to buckle up!